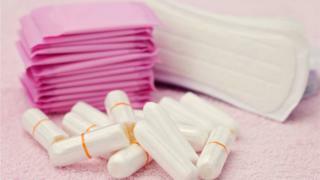 A scheme that would offer women reusable sanitary products to tackle "period poverty" is being supported by local councillors in Monmouthshire. Caldicot town councillor Rachel Garrick said research shows girls are missing school because they can not afford the hygiene products. She wants menstrual cups and cloth sanitary towels to be handed out to tackle the problem "sustainably". She said her proposal was "received brilliantly" by the town council. It is also supported by Chepstow town councillor, Hilary Beach who founded "dignity bags" for women in need. Ms Garrick told the town council it was "simple austerity" when women could not afford sanitary protection. "It's not just about period poverty, it's about sustainability," she said, adding used towels and tampons account for 200,000 tonnes of waste in the UK every year. She said the town council supported her proposal and there was "some budget available". They agreed to look at the cost before putting it back on the agenda. Ms Garrick's project is supported by Ms Beach who launched the dignity bags scheme on international women's day in March this year. The scheme has red and white spotted boxes located throughout Chepstow, including chemists and libraries, where people can donate sanitary products. Ms Beach said it works very much like food banks in that people donate items which are then packaged and sent to women in financial difficulty. "Women menstruate for half of their lives and it's a costly business," she said. "If you're a woman with children, you will choose to feed them before you spend money on sanitary products." Ms Beach has also been in contact with local schools to find out if they can help girls who are missing days because of periods. "There are vending machines in schools selling sanitary protection. I know they're for emergencies, but somebody is making a profit from them," she said. "I know Monmouthshire is an affluent area, but there are pockets of deprivation." Both councillors agreed it was refreshing that periods were something that could now be openly discussed. Ms Garrick said her proposal was seconded "without hesitation by a well-respected gentleman town councillor from the older generation". Ms Beach, who worked in the healthcare profession for 30 years, said "periods were just not talked about in those days. "When I'm packing the dignity backs with the other ladies in their 60s, we openly discuss it, which is great." Video Is there period poverty in the UK?